G. Aquilecchia, Giordano Bruno, in Encyclopædia Britannica; G. Aquilecchia, Bruno, Giordano (Philippus Brunus Nolanus; Iordanus Brunus Nolanus, il Nolano), in Dizionario Biografico degli Italiani, vol. 14 (1972); M. Ciliberto, Bruno, Giordano, in Il Contributo italiano alla storia del Pensiero - Filosofia (2012). The project La biblioteca ideale di Giordano Bruno. L'opera e le fonti was created as part of the initiatives planned by the National committee for the commemoration of the fourth centenary of Giordano Bruno’s death, headed by Michele Ciliberto. All the complete texts of the Latin and vulgate works of Giordano Bruno can be found on this site, as well as his “imaginary library”, i.e., a survey and transcription of the sources which he used to carry out his research and philosophic writing. 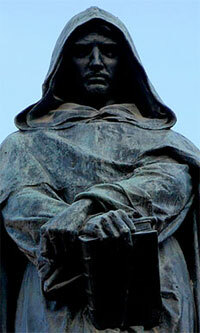 The sources Giordano Bruno used for his writing have been identified and each source has been connected to the relevant text(s), thanks to careful bibliographic and philological research carried out by a team of about thirty experts. The site can be easily and rapidly managed and searched for both text and images.